From 3rd to 4th June, Professor Naser Sayma and his research team led a workshop to debate the use of a concentrated solar power (CSP) system for producing electricity. Professor of Energy Engineering, Professor Abdul Naser, organised and hosted a workshop from 3rd to 4th June to debate the use of concentrated solar power (CSP) dish systems with visiting senior representatives from the European Union (EU) and the People’s Republic of China’s Ministry of Science and Technology (MOST). 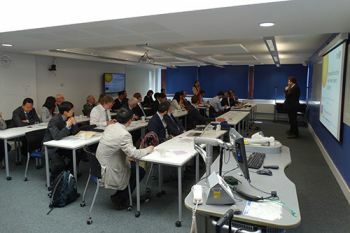 Also taking part in the workshop were interested academics and industry representatives from China and Europe. Professor Roger Crouch, Dean of the School of Mathematics, Computer Science and Engineering (SMCSE), welcomed the workshop’s participants. The workshop was supported by the EU under the EU FP7 programme as part of the City-coordinated, Optimised Microturbine Solar Power system (OMSoP), which is also led by Professor Sayma and his research team. It is aimed at providing and demonstrating technical solutions for the use of state-of-the-art concentrated solar power systems coupled to micro-gas turbines (MGT) for producing electricity. The intended system is expected to be modular, producing electricity in the range of 3-10 kW. Over the course of their two-day workshop, delegates presented their most recent research and innovations in the field and discussed future collaboration on the development and demonstration of CSP systems. They also visited the test cell in the SMCSE engineering labs, where an advanced micro-gas turbine test rig has been commissioned by Professor Sayma and his team. An apparatus used for assessing the performance of a piece of mechanical or electrical equipment.